This is where we share tidbits and trivia we have picked up along the way. 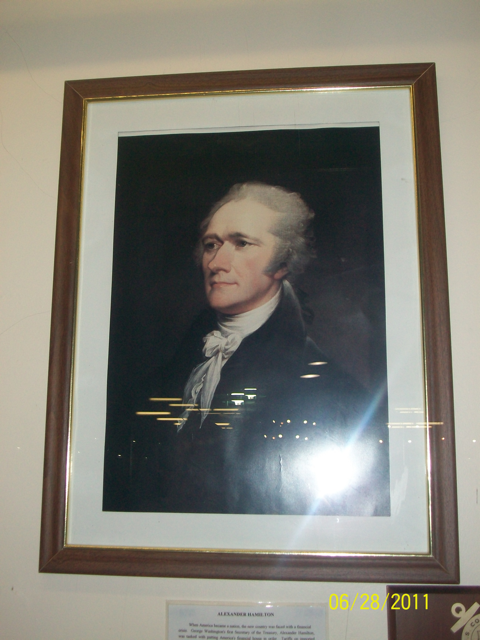 06/28/2011 - Sault Saint Marie, MI - Alexander Hamilton is considered the Father of the Coast Guard. Why? In the early days of the United States, collecting revenue from imports was an important source of income to the new nation. As Secretary of the Treasury, Hamilton was in charge of collecting that revenue. Smuggling made this very difficult. Hamilton asked Congress for approval for a fleet of ships to go after the smugglers and collect. From this, today's Coast Guard was developed! 06/11/2011 - Ft. Campbell, KY - Ft. Campell is the location for the Air Assault School for the Army. While the address is listed as Kentucky, part of the base lies within the Tennessee border. Why? During World War II, letters were being mailed to Camp Campbell, KY and Camp Campbell, TN. It was very confusing and things were continually getting messed up. So, the powers that be decided that something needed to be done, but how could they decide which state to use for the Camp's address? The post office on base lies within Kentucky, so that's what they went with. 06/07/2011 - President James K. Polk - His final resting place is truly final, now. Polk and his wife were both buried on their land in Tennessee. However, since neither had any survivors, their land was sold. The new owners didn't want the former President buried there, so the state paid to have them both exhumed and moved to the final place at the state capitol. 02/22/2011 - Thought I might include a 'live' shot of the monument in Enterprise. I was there again today and took this shot while driving by. Notice the big difference in vehicles from the first picture to this one. 02/08/2011 - Does anyone know why there is a monument to a bug in Enterprise, Alabama? There is a monument to the Boll Weevil in downtown Enterprise. By destroying entire cotton crops by 1915, this distructive insect forced farmers to deversify their crops, which brought additional revenue into the area. Peanut farming became an important crop, with Coffee County producing and harvesting more peanuts than any other county in the nation. For more information, visit The History of Enterprise, Alabama.